Time took to create: “Roughly 3 Hours”~ Comment from Hall on his Deviant Art account. I like Hall’s design due to how he managed to create the arm’s image out of the names of parts of the arm. 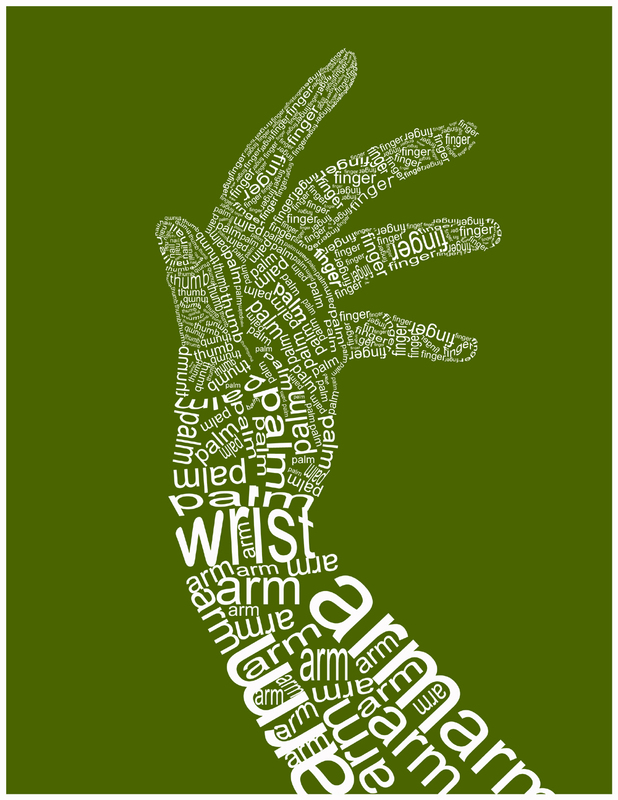 His unique formatting, of putting the names of the parts in the area where they are found (IE: having the word “wrist” in the area where you typically find a wrist), makes the whole design even more creative. Compared to Clark’s (the designer from my 1st type evaluation) creation of having random names thrown all over the design, Hall’s design makes the words more meaningful through his placement of where they correspond. Another aspect I like about the design is that Hall doesn’t use any techniques that really impair a viewer’s readability and the piece’s legibility. Some of the words do appear in a font size that may be really hard to see without a magnifying glass; however, a lot of the letters are legible to the point where whoever looks at the piece can understand and “read” the word that is there. His placement of the names into their corresponding part of the arm helps readability/legibility as well when the font may be too small to fully make out. Hall does not seem to be using any distortion of tracking to fit all the names in as well. Everything seems to be fully proportioned without having to squeeze letters together in order to fully form a perfect image of an arm. The only tool that seems to distort the font is that the majority of the font appears to be created using a type on a path tool to create the bending of words needed to shape out some of the arm’s pieces. The bending of words makes some of the letters appear not to sit on the baseline, like in the word “wrist”; however, the size is the same and it is clear that no real distortion of the text had to be used to create the word. The green background and white text seems to add to the image by making the design have more flair then creating it only in grayscale. The colors are not distracting and work highly well in this piece. Overall: I really enjoy Hall’s work. I cannot find any flaws that I would change. Social Action Magazine Spread FINAL! Maryville College Intro To Design "Stuff"